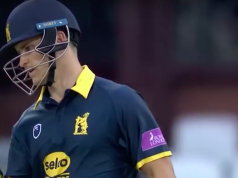 The Birmingham Bears have won two of their three games in the NatWest T20 Blast so far and will be looking for a win against visitors Yorkshire to boost them up the table. The Bears have plenty of batting but could do with more substantial contributions from middle order players such as Laurie Evans, Ateeq Javid and Luke Ronchi. In the absence of Chris Woakes, their bowling leans heavily on that ever-reliable pair, Rikki Clarke and Jeetan Patel. 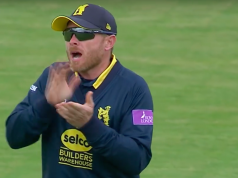 Oliver Hannon-Dalby and Recordo Gordon who last year took over 40 wickets in the T20 Blast have not shown too many signs of repeating that success and have also leaked runs. Leg-spinner Josh Poysden seems to drift in and out of the Bears’ plans so there is a need for someone to step up and offer better support to Clarke and Patel. As for opponents Yorkshire, they travel to Edgbaston without a win to their name in the T20 Blast this season. Even worse, like a bottle of cheap wine, they don’t travel well, not having won in T20 outside Yorkshire since May 2015. This level of failure is difficult to understand when you look at the calibre of players in their squad. They have three men – Liam Plunkett, Adil Rashid and David Willey – who played in the World T20 Final for England just two months ago. In addition, the team boasts England internationals in Tim Bresnan, Gary Ballance and Adam Lyth. With such talent at their disposal, what could possibly go wrong? The answer, so far, is just about everything. Apart from Joe Root who scored 92 not out in his only appearance, no-one has yet reached fifty with the bat. Bresnan and Plunkett have bowled well but Rashid averages over 100 with the ball and has gone for more than ten runs an over. Youngsters Will Rhodes and Ben Coad haven’t delivered so far. That’s the problem; but what is the answer? “I think we need a bit of a boost from somewhere,” says Director of Cricket Martyn Moxon. Somewhere? Anywhere? How about New Zealand? The Kiwis’ star batsman Kane Williamson joins the Vikings for the next six weeks and plays his first game tonight. Maybe there is still hope for Yorkshire. Their cross-Pennine rivals Lancashire won the T20 trophy last year after losing six times in the group stages. And here’s another straw for the Vikings to clutch at. For their last nine fixtures, the Bears have alternated between victory and defeat – and they beat Durham last week. Bears’ young batsman Sam Hain missed the win over Durham with food poisoning. But he already has an innings of 92 not out in the competition; and his recovery was confirmed when he hit his maiden list A hundred in the 50 over competition this week. We may as well have rhyming key men – Hain and Kane. As already mentioned, New Zealander Kane Williamson returns to Yorkshire and will make his first appearance this evening. He is a class act as an international batsman as well as being a calm man in a crisis. 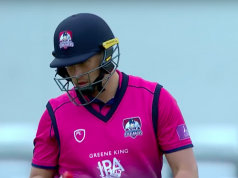 He captained New Zealand in the recent World T20 so will no doubt be on hand to offer advice and guidance to Vikings’ skipper Alex Lees when the heat is on. Maybe he is the man to provide that extra bit of inspiration to lift the Vikings out of their appalling run of T20 form. The Bears are without Chris Woakes, absent for England. Two products of the Bears’ youth scheme, all-rounder Aaron Thomason and batsman Matt Lamb, make the squad but it is unlikely that both will play. For the Vikings, Jack Brooks is out for up to a month with a leg muscle injury. Fellow pace bowler Matthew Fisher has a recurrence of the hamstring tear that originally occurred pre-season. Jonny Bairstow and Joe Root are,of course, otherwise engaged. Young left arm spinner Karl Carver makes the squad. After a dry day, some showers may develop during the evening – hopefully not enough to disrupt the match. Groundsman Gary Barwell generally produces pretty good pitches for one day matches and, weather permitting, this should be no exception.